Today I am chatting about a boutique that I had the pleasure of being introduced to several months back. White Plum Boutique is a fun place to shop online, discover the latest trends and at an affordable price point. I fell in love with the subtle sequins on the elbows of this cardigan. While it's a basic piece, it also adds a bit of sass and sparkle. It's the perfect length to wear with leggings and cover your backside. The stripe tunic holds a special place in my heart because it's the colors of my alma mater...GO TEXAS STATE! I should have taken pictures without the cardigan...nice after thought once I was editing. Anyway, it has camel colored patches sewn to the elbow area as well. You can see more pictures here. White Plum Boutique has been kind enough to offer one lucky reader $50 credit to their store. You can also use the code SHANNASAIDSO at checkout to receive 20% off your purchase. This is valid until October 29th. Happy shopping and good luck! Enjoy your weekend. *Thank you to White Plum for partnering with me on this post. Compensation and clothing was provided, but all opinions and content remain 100% my own. hello! 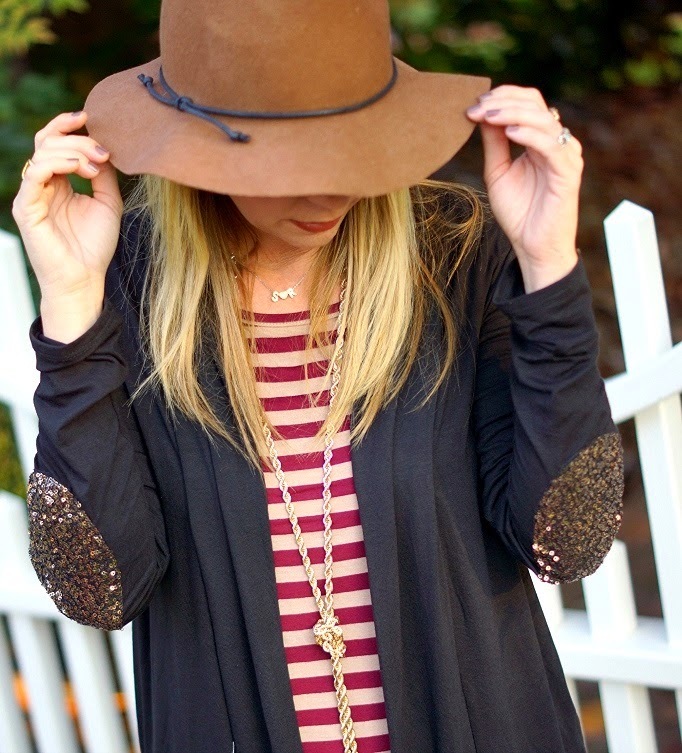 love the hat and the cardigan! this little embelishment is so pretty! You look so cute, love this comfy look. Have a great weekend. Oh my gosh, that cardigan is so cute, I love the bit of sparkle on it. You look very cozy. Great outfit. 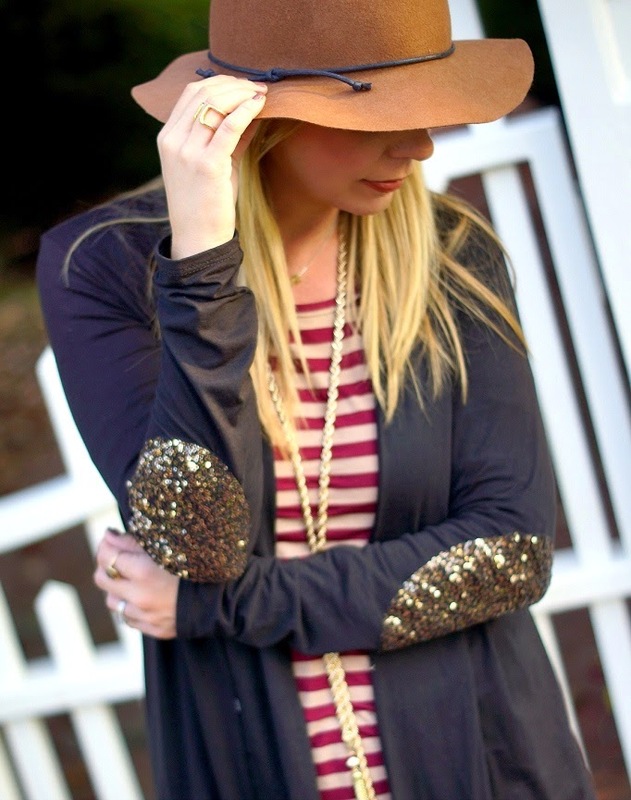 How cute is that cardigan with the sequin patches?! Love it!! Love it all!! Want one of those hats! Don't know if I'm brave enough!! Have a great weekend! Just popping in to tell you how beautiful I think you are! 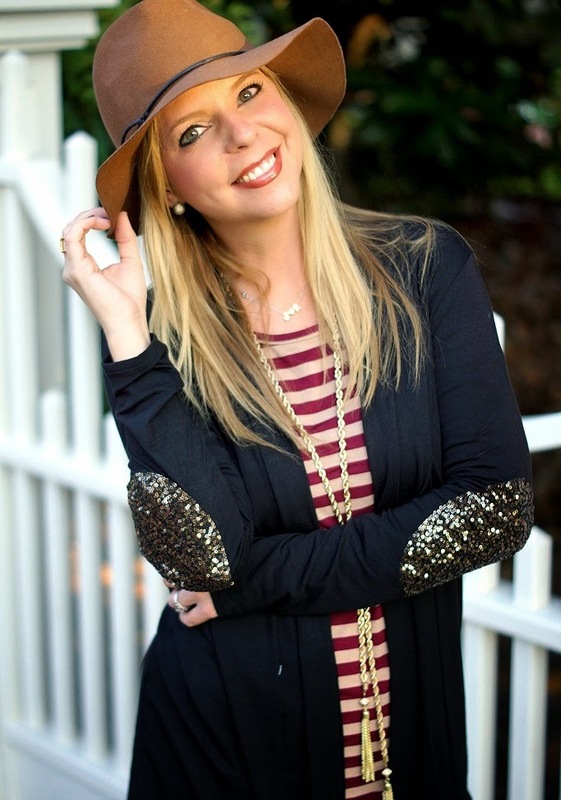 Love the sparkles and the hat! you are rocking it girl! So cute--love the cardigan! What size are you wearing? TIA--Happy Friday! Super cute. I love this outfit but adore the glitter detail on the cardigan the most. Oh girl...I love this outfit!! Very nice pairing of the striped tunic with the adorable cardigan. I love your style! Love the sparkles and the clutch! Your outfits are always a win! Happy weekend! Shanna, I love the sequined elbow patches! So adorable. Your hat is super cute too. Elbow patches for the win! Also, you are looking so gorgeous in the up close photo where you're smiling at the camera. Beautiful! Gotta love some sparkle :) Your Instagram of this was the first thing I saw this morning, and it was a happy thing to see! Love the outfit !!! Thanks for the giveaway! Those sparkly elbow patches are so fun! Love how you styled this look. love this whole look! thank you for the giveaway! I love elbow patches, but sequin ones?! I WANT!!! So cute! And way to rep your team without looking like a bro!